staff srgt william n. mccormack sr.
every american on corregidor was a hero, but what singles out corporal william n. mccormack, a husky marine from aransas pass, texas, from the rest of them is his combat record unequalled by any other american. during a 30-day period he was cited for “gallantry in action” and awarded four separate silver stars-the nation’s third highest combat decoration. by any standards, mccormack’s heroism in combat should have brought him (and probably would have in later years in the war) the medal of honor. mccormack’s great adventure began on a hot, humid morning in early may, 1942. that was the day when corregidor, the “gibraltar of asia,” crumbled under a japanese attack backed by 300,000 of the emperor’s toughest troops. that was the day a rocky symbol of resistance and courage dissolved into a smoking myth and stunned a nation. but corregidor is still a symbol of valor to the u.s. marine corps, a reminder of the fighting men of the misbegotten fourth marines-battalions made up of leathernecks, sailors without ships, airmen without planes, soldiers without regiments and the rest of the military flotsam and jetsom of the bataan debacle. a lot had happened in six months to bill mccormack and his buddies. mccormack was one of the younger noncoms in the regiment that guarded shanghai’s international settlement. the older noncoms were tough, leathery faced and grizzled veterans who had fought at belleau wood and chateau thierry during world war 1. the senior officers had seen their share of combat service in france and later in the caribbean. the fourth marines was a regiment proud in tradition and composed of professional soldiers to the last man. mccormack joked with his buddies as they marched jauntily down bubbling wall road to the shanghai docks on a cloudy late november afternoon in 1941.
the men in headquarters company’s first platoon laughed loudly without breaking their even cadence as they turned onto the dock toward the gangplank leading to third class quarters on the luxury liner s.s. president harrison. nine days later they landed at longapo in the philippines. on the tenth day, in the early dawn of december 8, their first day in the islands, 1,600 marines were turned to by a bugle sounding the unfamiliar call to arms instead of usual blast of reveille. the u.s. was at war with japan. during the next 18 days regimental commanding officer colonel samuel l. howard, affectionately referred to as colonel sam by the “china marines,” chased in his staff car between his headquarters at the cavite naval base and army headquarters in manila pleading for a chance to use his regiment on the luzon front. general macarthur’s headquarters gave no reply to colonel sam’s frequent requests. the general was feuding with the navy’s far east fleet commander. and when the general was down on a man, everyone connected with that person suffered. finally, orders were received on christmas day for the fourth to pull out and ship over to corregidor where the regiment would be kept out of trouble manning the non-existent beach defenses of the fortress island in manila bay. the first group of marines landed on the “rock” on the 20th. the leathernecks of mccormack’s battalion got a cold reception from the general’s aides, but later that afternoon they were given a hot welcome from the japanese air force. a squadron of mitsubishis unloaded 20 tons of delayed christmas presents that ripped up the concrete middle side barracks where advance elements of the fourth were quartered. one man was killed and another wounded. colonel sam blew his top and rushed to the island’s command post headquarters deep in manila tunnel. exasperated, he chewed out one of macarthur’s aides and said he wouldn’t leave until he received an order in writing to move his men where they belonged, to the beaches they were brought over to defend. the marine commander made no bones about his men being safer in foxholes and bunkers on the beach than as targets atop malinta hill. colonel sam spent the next two days climbing over every rugged foot of corregidor’s beaches. with a practiced eye he mentally noted every possible landing position and countered his mental notes with a carefully charted defense plan. in the states, meanwhile, the experts were all commenting on “the rock’s” invincibility. corregidor’s shoreline jutted abruptly from the bay and in contour resembled a tadpole. the island’s tail was a sandy spit which trailed in the direction of manila 27 miles away while the rounded head pointed toward the china sea. as seen from passing steamers before the ware, corregidor appeared green and peaceful. its lush tropical forests alternated with sheer rock and deep ravines. corregidor was slightly less than four miles in length form tadpole head to tail and about a mile and half wide at its widest point, and it included 640-foot malinta hill. “the rock” was strategically situated at the entrance to manila bay and surrounded by other small fortified islands that composed the coast artillery defenses for the philippines major shipping port. malinta hill was a hollowed out chunk of rock that military experts called a tribute to american ingenuity. they said “the rock” was a bastion of military power in the far east and compared it to gibraltar and the french magi not line. perhaps they forgot that the magi not line had fallen 18 months earlier. malinta hill was honeycombed with caves and interconnecting tunnels. most of the huge tunnels measured 30 feet to the curved ceilings that stretched away into the distance like gothic arches in a great cathedral. the experts were correct on one point: the japs didn’t have a bomb powerful enough to penetrate malinta hill and blast the deep underground tunnels and caves. before the japanese attacks 8000 persons, including 3000 american coast artillery and anti aircraft troops, lived regularly on the tiny island. inside the tunnels was a unique streetcar system of tracks, cars and stations, but without conductors. all rides were free. the brass in washington was convinced that that, in any eventuality, “the rock” was the best place to hold out. americans heard and read about parfits widely quoted talks which described how “the rock” was equipped with three years supply of food, ammunition and water. the island’s water supply, explained parfit, came from deeply drilled artesian wells which could never be hit by enemy bombardment. no matter what, the retired army officer said, corregidor will forever remain the americans stronghold in asia. just when events were taking a turn for the worse on bataan, a number of “expert” opinions reaffirmed the faith of american people in their military leadership in asia. a flood of communiqués came from washington describing every action as a minor victory for our side. but even the war department public information officers were hard pressed to keep up with the personally censored battle communiqués that were issued from the general’s headquarters inside “the rock”. stateside, the nation was grasping vainly for strength. the public needed victories and heroes. both were supplied. there were no really great battles on bataan except in the newspapers back home. the size and scale of japanese attacks were always exaggerated. army air force captain awarded the distinguished service cross for sinking the battleship haruna, while a myth grew that he had received the congressional medal of honor. but this mighty enemy battlewagon had never been under attack in the philippines and the haruna actually fought her last battle more than three years later when she was sunk at kure. the japanese commander of enemy troops on bataan, lieutenant general masaharu homma (later executed for war crimes) was reported to have committed hara-kiri because he had been “disgraced by his defeats”. but japanese strategy was obvious to the field commanders on bataan and the few alert staff officers on corregidor. the japs were in no hurry. they were fighting a war of attrition and allowing time, disease and starvation to weaken american forces before mounting final attacks. meanwhile, on the rock the marines worked and sweated. bill mccormack was one of them. gradually they grew lean, hard, sun bronzed and tense working under the tropical sun. the lines of tension under their eyes were etched deep from sleepless nights and hours of strain. they seemed to take on the look of the island about them and the lush, fulsome loveliness of corregidor was slowly dying. heavy tropic verdure was burned away, great tress were splintered and scorched, and the earth showed the raw pockmarks from thousands of bombs which had chewed craters of all sizes on the island. the prelude to battle came in middle january 1942 when the general issued a still unexplained order to every combat commander charging him with personal responsibility for delivering this message to every last man in his unit. “bull…. !” the more cynical leatherneck noncoms snorted, mccormack among them. while battle weary men on bataan awaited help that never came, mccormack and his buddies of the fourth marines kept on digging their beach defenses for the final attack against the island fortress that colonel sam expected an early in may. they shaved when they could, they bathed by crawling through the concertina roles of barbed wire on the beaches, and they swam at night in temped water of manila bay despite the danger of sharks. lack of vitamin a in a monotonous diet gave them night blindness. air attacks against the rock continued. out dated anti-aircraft guns and lack of ammunition also failed to keep off the enemy bombers and fighters. the japanese were still taking their time on bataan peninsula when on march 11th macarthur, under orders from washington, pulled out with his family and top members of his staff to australia. he left his rapidly dissolving command to lieutenant general jonathan m. wainwright. an unseen but heavy depression and desperation disappeared for a while with the general’s departure. the marines immediately took a like to wainwright. he frequently inspected the beach defenses and shared foxholes with privates when the shells whistled in. just before the end came on bataan the general issued another strange order from his new ghq in australia. he didn’t mince words, and the fighting men left on bataan and corregidor had plenty of time to ponder. however, the problems of the high command never filtered down to the platoons and squads manning the beach defenses. the end was in sight on bataan. the marines provided a patrol of volunteers including mccormack to leave the fortress island and scout the situation on the embattled peninsula. the reconnaissance patrol’s mission was to observe and report back whatever could be learned from the chaos on bataan. orders were not to engage the enemy unless the japs prevented the patrol from returning with its vital information. the debacle on bataan horrified the marines who had been taken their share of serial bombardment on the rock. it was time to return to the beach and the boats to carry the vital intelligence back to corregidor. mccormack, leading on the point, spotted a large jap patrol lower down on the slope leading to the bay. he signaled back to the control commander to halt. it was obvious to the marines they were cut off. there were to many japs. “your liable to kill yourself mack,” the officer replied. “it’s our only chance lieutenant,” mccormack said. the officer silently nodded his ok and the texan slithered off through the jungle in the direction of the jap patrol and the ammo dump. in the distance the sound of jap artillery rolled closer as the enemy chewed up the american troops who were now in full retreat toward the beaches. there’s no citation for this act of heroism for this lack of heroism that the u.s. army awarded him his first silver star in general orders. no. 21 on april 6th, 1942. he received his second decoration three days later. the beginning of the end came in a hideous spectacle on april 8th. from their fox holes the marines watched the pall of black smoke from behind the hills ringing manila bay and heard the sound of approaching japanese artillery fire. then there was silence for awhile on the hot april morning. that knight the crashing jar from huge explosions shook the men both physically and mentally. they knew what was happening. retreating americans blew up supplies of gasoline, ammunition and equipment cashed in four huge tunnels carved in the mariveles mountains overlooking manila bay. under the red-orange glow of exploding ammunition and flaming gasoline, the marines in corregidor’s trenches saw an entire mountainside dissolve into dust and debris and slide into the bay. boulders were hurled into mid channel, small boats filled with desperate men trying for the uncertain safety of corregidor were smashed by flying rock and bits of jagged metal period. a human head was catapulted to the rock. for the leathernecks on corregidor it was the last chapter. the next day a strange procession streamed across the treacherous five miles of water separating bataan from corregidor. it was a rag-tag fleet of every available and imaginable boat ranging from the navy’s in shore patrol of ancient tugs and mind sweepers to private luxury launches commandeered by escaping troops, rusty and creaky old inter-island freighters, made of canoes, leaky row boats and make shift rafts. these carried 2000 odd defeated and demoralized men lucky enough to escape. but a reluctant order was issued by general wainwright. he said he would turn back anymore men after the ninth day because corregidor had a limited amount of space. manila bay was cluttered with boats when the dawn broke on that ninth day of april. japanese planes had a field day shooting fish in a barrel. as he scooted over the sandy terrain, two aircraft peeled off and dived at the running figure on the ground with machine guns chattering. bullets sizzled around mccormack and he practically felt the heat of the tracer and heard the bullets hiss passed as he zigzagged like a quarter back running the ball. the award of his second silver star was as much as a surprise to mccormack as it was to his buddies. “are you going army?” they chortled, unaware how close to the truth they had come. “china marines” were not only going army, they were also going air corps and even navy. the regiment had been under strength when it left china and there was only one way to bring it back to fighting muscle. that was to fill the ranks with replacement. these were the men from bataan who had stumbled off the boats. they were woe-begon scarecrows who arrived without arms or equipment. some of them were almost necked and nearly all were half starved and ill with malaria, jaundice and jungle fever. colonel sam was ordered to draft the remnants from the mainland into his regiment. the proud china marines, nurtured and legend by the corps, became a unique force. they were plumped out by the rag-tag and bob-tail men from the army’s 31st and 57th infantry regiments, some nine hundred american sailors who had never handled a gun except in boot camp, 929 philippine army soldiers, 246 philippine scouts and an assorted group of army air corps pilots and ground crews way out of their element. the fourth was build into a 4000 man force to defend the fortress and the its 7,500 other rear echelons non-combatants. bataan now was history. the japanese moved all of its big guns for the final assault against the rock. inside malinta tunnel a psychological illness spread through the mass of men and women. they refused to leave the safety of the tunnel, even at night. the caverns rocked and echoed and throbbed like a huge base drum every time a shell plowed into the island. the constant pounding that reverberated through the malinta tunnel’s, shell shocked rear echelon troops into the battle fatigue experienced by the marines and the reinforcements topside and on the beach. by the time the final hour on corregidor rolled around the rock was blasted and burned beyond recognition. trees that were once so dense as to shut out the sun were reduced to charge stumps. even the shape of the island was changed. during the three weeks after bataan, increasing japanese artillery fire chewed into the swollen ranks of the marines. new rows of graves added to the fourth regiments burial plot overlooking san jose a bay. by april 13th the japs had 400 big guns zeroed in on corregidor which the marines referred to as the “bulls eye”. that was the day bill mccormack came by his third silver star. the entire island was under enemy observation. balloons with artillery observers rose from jap positions of the hills looking over manila bay. observation aircraft circled overhead. the shells whistled in without let up and salvo after salvo thundered into the coast artilleries gun emplacements which had been built with one severe draw back. they had been constructed wide open with no protection from aerial assault or height trajectory artillery fire. assault had been expected from enemy naval ships, not from land or the air. one salvo crashed into battery james, trapping the gun crews who had taken shelter in tunnels. a runner came down to the beach where the marines were hold up. “we need volunteers to dig out the wounded,” he chocked and pointed to the smoking emplacement on the hill above. it seemed that the jap artillery and bill mccormack were fighting a personal war as he clambered up the slope with explosive burst erupting behind and bracketing his trail toward the bombed out battery emplacement. even while enemy shells smashed into the area, he continued to dig out the injured. on may 2nd, 1942, four days before the end, a massive artillery and aerial bombardment, the greatest that “the rock” had undergone to date, shook the island fortress to its very depths. the japs were expected to try a landing at any time. the artillery barrage was hurting the defenders and mccormack’s fourth silver star citation best describes not only what it was like on “the rock” but what he did to deserve it. it was no longer a time for heroics. on the beach all phone communications were out. the few radios that were available rarely worked and the runners spent time dodging enemy shells and evading circling jap aircraft that flew machine gun runs against anything that moved. even the barbed wire beach defense had been chewed to bits by the massive bombardment. the once mighty and “invincible” fortress was a mass of rubble and twisted metal that represented huge 12 and 14 inch coastal guns and thick concrete emplacements. all that mccormack and his fellow marines had for defense were some mortars, and enough rifle and machine guns. the clock finally began to unwind on the evening of may 5th as time ran out for the americans on corregidor. 2030 hours: a white flare soared into the twilight from the highest point on the marriveles mountains. every japanese gun opened up. 2330 hours: a greed rocket from jap positions signaled an end to the barrage. manila bay suddenly became quiet. only the occasional cry for a medic broke the stillness of the night on corregidor. 0000 hours: midnight. the silence were heavily for half an hour until the sound of barge motors was heard off the north and south shores of “the rock.” the alert was sounded. after four months of continuous bombardment the fourth marines and their recruits were about to face the japs. it was now may 6, the day the end came. the first enemy wave struck 15 minutes later near north point on the low tail of the island and then swept westward in a wave extending to artillery point. the marines opened up with everything they had. 0200 hours: another white flare signaled a half hour barrage which ceased abruptly with two green rockets. “well, this is it,” mccormack spat into the dust at his feet. they were all afraid, the marines regulars and the replacement “marines” who were suddenly prepared to die with the regular leathernecks. the corporal from texas was determined to hold his bit of ground until the end and the men who manned the machine gun nests and foxholes were ready to die with him. 0600 hours: the japs inched forward under heavy rifle and machine gun fire after gaining a toehold. during that first enemy rush half of the officers commanding the marine battalions, companies and platoons were killed or wounded. once company was commanded by a gunnery sergeant. another had lost all of its non-coms; the decimated squads played it by ear. marines, all of them, no matter which military service uniform they wore, lobbed grenades onto the beaches, manned red hot guns and died in their positions. but the japs couldn’t be stopped. bearded and bleary eyed, mccormack held his position, kneeling in a shell crater, while men around him fell before the enemy’s guns. he saw the dim forms of the japanese soldiers moving through the smoke of battle and he met them head on, emptying a pistol and downing four of the little men in dusty khaki before he dropped his weapon. frantically, he searched for another fighting tool. anything, even a shovel. there was nothing in the crater. with bullets chewing the dirt at his heels, he scrambled a few yards to another hole in the ground where the warm bodies of several buddies lay still in death. he jerked a rifle from the hands of one of the dead beach defenders who, he noted from his uniform, had lately “joined” the regiment, and snatched a bandolier of ammo from another body of a man who only the day before was a member of his own company. mccormack dropped to the ground again, kneeling and firing from this position feeding clip after clip into the bolt action springfield rifle until his muscles grew taut form the loading and firing action. then he ran out of ammo. the enemy continued to storm the beach behind a massive barrage. mccormack was cornered. he looked for a way out of what had become a trap. “somebody cover me!” he hollered to anybody above the noise of battle and dashed from his protective hole to the next one where he knew a machine gun nest had been located. it had been knocked out by a mortar shell lobbed from one of the landing craft the japs had outfitted as an artillery support boat. he pushed away the bodies slumped over the light 30 caliber weapon and jerked it form its tripod. “c’mon you bastards!” he shouted at a group of charging japanese. cradling the gun in his arms and bracing it against his hip while half crouching, he squeezed the trigger firing burst after burst at the enemy until they fell or turned and ran back to the waterline. hooting like a texas rebel, the once husky marine continued to fire into the advancing japs. despite the hot barrel that began to take on a reddish glow, he sprayed two belts of ammo into the enemy sending about 50 to join their ancestors. about 70 more were wounded by this heroic noncom. a brace of shells whistled in and bracketed the position. the concussion floored mccormack and a high tide of little brown men swept across his position disregarding the unconscious form partially covered with dirt and rocks. the time was approximately 0700 hours. three and a half hours later the tactical situation grew worse and from the command post beneath “the rock” known as corregidor came the final order, “execute operation pontiac, pontiac!” it was the order to prepare to surrender. all currency was cut into little scraps and classified intelligence documents were burned. when bill mccormack recovered consciousness he stumbled back up the hill from the beach which now was unusually quiet. ragged, scratched up, his body bone weary and muscle sore, the doughty noncom stumbled to the entrance of malinta tunnel. he couldn’t help but see colonel sam howard place his face in his hand and weep. lanky “skinny” wainwright, now united states army field commander of all american combat forces in the philippines trembled visibly as he prepared to go to bataan and sign the enemy surrender document. tears slowly coursed down the cheeks of his thin, angular face, etching a crooked trail on his dusty skin. wainwright in defeat surrendered an entire army group. 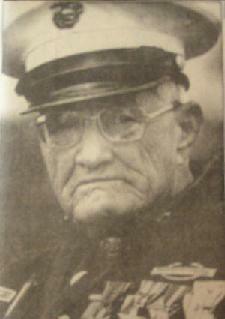 and bill mccormack cursed the enemy, cursed his officers and finally cursed his country for letting down his buddies and himself when they needed help the most. his desperation gave vent to anger. he was as loyal as his officers. but the leathery faced noncom had wanted to keep on fighting to the end. then it was over. tears blurred bill mccormack’s eyes as the regiment’s colors were brought out of malinta tunnel and burned so that they wouldn’t fall into the hands of the japs. of the 1368 leathernecks and their 72 officers who had been deployed on corregidor, 330 were killed in action and 357 wounded. of those who survived and were taken prisoner by the japs and hauled on the long death march to pow camps 239 more marines succumbed. by the time the japs threw in the towel there were only 871 emaciated marines from the “china regiment” left alive in enemy pow camps in manchuria and japan. corporal bill mccormack, with four silver stars on his record acquired during 30 days of hell, stumbled to freedom when his camp was liberated after v-j day. miraculously, jap bullets and shell fragments did not kill him, he took a year to recuperate from the brutal confinement of enemy prison camps. when he finally received his silver star medals and citations and oak leaf clusters, a marine corps colonel quipped: “you might be able to trade them for a medal of honor. the texan shook his head and grinned. anybody can earn a medal of honor the hard way. however, nobody had ever been awarded four silver stars. and that’s what distinguishes ex-corporal bill mccormack from any other american fighting man. website by david mccormack sr.